Negrilonestop.com The official booking agent for Negril Jamaica! 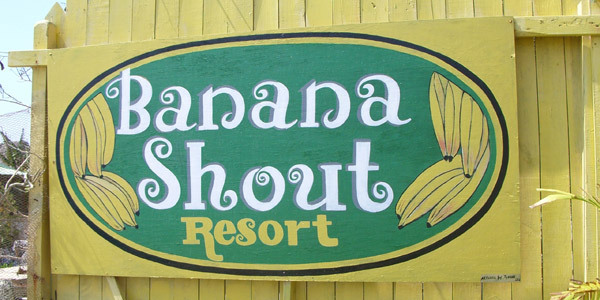 Banana Shout Resort is located in the western coastal area of Jamaica, on the coral cliffs of the western portion of Negril. It is only one-half mile from the historic Negril Lighthouse. Under new ownership, it has just been renovated and transformed into a little Boutique resort and offers you the coolest way to discover Jamaica. The new resort is completely hand made by Jamaicans, from the buildings to the furniture, to let you feel the Jamaican culture. TV is not available by choice: this gives you a real holiday, away from the chaos of the modern world. Our show is the nature that surrounds us. Air conditioning is not available or needed because we are blessed with a natural sea breeze that enters in the cottages. In the winter season blankets are available. The Resort is dedicated to Jamaican art and culture, and it shows on every cottage. Each cottage includes a selection of different style of island art by paintings and carvings. Rates per cottage per night. Continental Breakfast included in the High Season. Add 10% tax to ALL rates.